This is the ultimate alpine adventure, weaving through meadows, reflective tarns and alpine gardens. You'll be rewarded with spectacular vistas over vast mountain ranges and valleys. Bookings are open for trips from 23 October 2018 - 30 April 2019.
International visitors - check new prices. Great Walk tracks are of a higher standard than most other tracks so are well formed and easy to follow. The tracks are usually quite wide depending on the terrain – some fit two people walking side by side in flat areas. The surface is usually gravel, rock or dirt, and like any track can get slippery in wet weather. Most rivers and waterways on these tracks have sturdy bridges. Occasionally there are also small streams that cross the track but are usually easy enough to step across safely. Be aware that in wet weather rivers can rise very quickly and flood the tracks. There are hill climbs where the track becomes steeper, which is all the better for views. Facilities are greatly reduced and there are additional safety hazards to consider. Walking the track during this time should only be attempted by fit, experienced and well-equipped people. For more information see Walking the Routeburn Track outside the Great Walks season. Walk the full track. 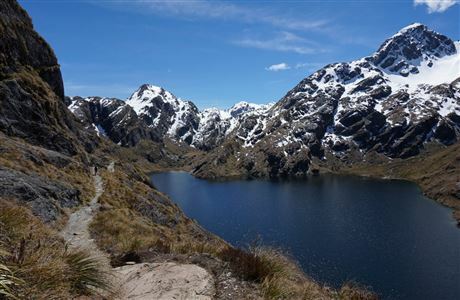 Most walkers take 3 days/2 nights usually staying at Lake Mackenzie and Routeburn Falls huts. The trip can be extended by also staying at the other huts and made into a circuit by linking with the Greenstone and Caples Tracks, which starts and finishes near the Routeburn Shelter. There are 4 huts and 2 campsites along the Routeburn Track, which must be booked in advance during the Great Walks season. Be aware that huts and campsites can book out many months is advance. Bookings for the coming summer season usually open in February - exact opening dates will be advised on our website closer to the time. Camping outside the designated campsites or staying overnight in the shelters, even when huts and campsites are fully booked, is not permitted. The track is patrolled by DOC rangers. Bunks with mattresses in a communal sleeping layout. Water supply, flushing toilets, wash basins with cold running water (but no showers). Heating with fuel available, and usually solar lighting in the main area. Cooking facilities with fuel, tables and seating (but no cooking utensils). A resident DOC ranger can tell you about the environment and weather, or help out should an emergency arise. Gas is not provided - you will need to bring your own cooking stove. Running water is turned off inside the huts. Water can be obtained from the outside water tank, if this is frozen, then from the nearest water course or by melting snow. There are no DOC rangers based at the huts. A friendly hut warden (from the nearby hut during summer season) who may visit to chat and check campsite tickets. The Routeburn Track has two starting and finishing points and may be walked in either direction. One track end is at the Routeburn Shelter (near Glenorchy and 68 km from Queenstown). The other is at The Divide (on the Milford Road, 85 km from Te Anau). The track begins at Routeburn Shelter, gently winding alongside the crystal-clear Route Burn (river). After passing Sugarloaf Stream, you’ll climb to Bridal Veil Waterfall and continue above the gorge. 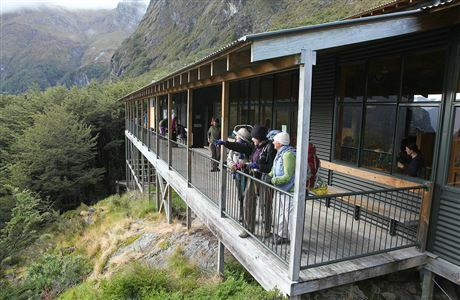 A swing bridge leads to open grassed flats, and the Routeburn Flats Hut and Campsite. The track climbs steadily through stunning beech forest, providing views of the Humboldt Mountains. End the day at Routeburn Falls Hut, on the edge of the bushline and close to the impressive Routeburn Falls cascade. Climb steadily up the valley, through wetlands and tussock-covered flats, before sidling along the bluffs above Lake Harris to reach the highest point on the track at Harris Saddle/TarahakaWhakatipu (1,255 m). 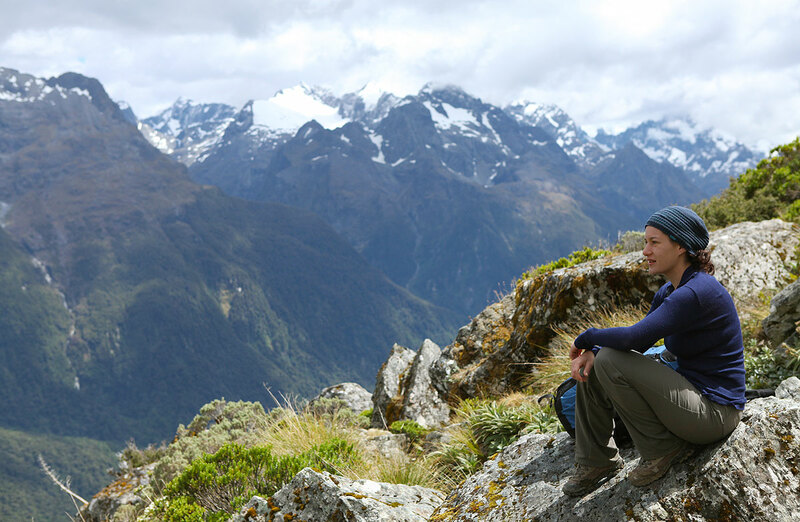 The track then descends and traverses along the exposed Hollyford Face, with expansive views over the Darran Mountains. This section of the track is well-known for its impressive array of alpine plants. A steady descent leads to Lake Mackenzie Hut, set beside the enchanting Lake Mackenzie. A short, steep climb from the Harris Saddle up Conical Hill gives superb views of the Hollyford Valley through to Lake McKerrow and beyond to Martins Bay and the Tasman Sea. Snow and ice can sometimes make this trip hazardous early and late into the Great Walks season. Due to rock fall danger, observe the no stopping zones along this track. Leaving Lake Mackenzie Hut the track crosses a small flat before climbing to the bush line. A gradual descent then leads past the ‘Orchard’, an open grassyarea dotted with ribbonwood trees, to the impressive Earland Falls (174 m). The track continues its descent through beech forest to Lake Howden Hut. The well graded track climbs steadily for about 15 minutes to the Key Summit Track turn-off. From the Key Summit turn-off, the gradual downhill walk is through silver beech forest to The Divide on the Milford Highway. At 532 m, The Divide is the lowest crossing of the Southern Alps in New Zealand. 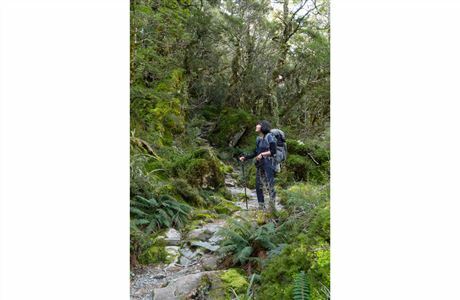 This popular walk climbs above the bushline to an alpine wetland and, in good weather, offers magnificent views of the Darran Mountains and the Hollyford valley. A self-guided alpine nature walk passes a range of native vegetation: beech forest, subalpine shrublands and alpine tarnsand bogs. Birdlife is prolific and tomtits, robins, New Zealand pigeons/kererū and bellbirds/korimako are commonly seen. Find out about fees for the huts and campsites on the Routeburn Track and how to make reservations during the summer season. Walking the track outside the Great Walk season should only be attempted by fit, experienced and well equipped trampers. 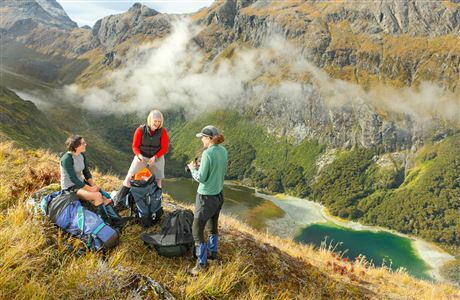 A 10% discount is available to members, staff and instructors of the following organisations, who also hold a valid 12 months Backcountry Hut Pass: NZ Mountain Safety Council; NZ Federated Mountain Clubs; NZ Deer Stalkers Association; NZ Land Search and Rescue (LandSAR); Scouts New Zealand; GirlGuiding NZ. Discounts are not available online and apply to the summer season rates only. To receive the discount we need to sight your membership card and Backcountry Hut Pass, so visit a DOC visitor centre in person. If you get a discount you won't be charged a booking fee. Huts and campsites can book out many months in advance. Exact dates when booking will open are advised on our website closer to the time. Note: Camping outside the designated campsites or staying overnight in the shelters, even when huts and campsites are fully booked, is not permitted. The track is patrolled by DOC rangers. 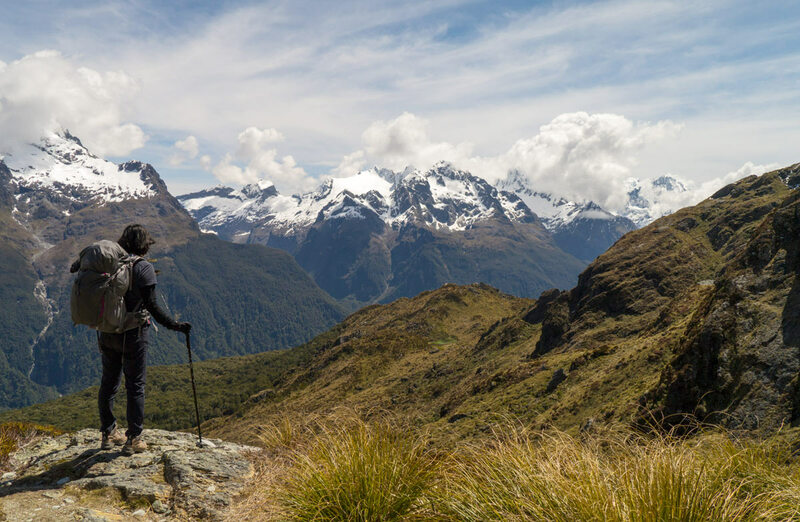 If the Routeburn Track is fully booked, other options to consider in the surrounding area are: Greenstone Caples Track, Hump Ridge Track, and Hollyford Track. In the Great Walks season you need to book huts and/or campsites on the track. Outside the Great Walks season you don't need to book but you need to take a Backcountry Hut Pass/Tickets. During the winter season there are reduced facilities and additional safety hazards to consider. See Outside the Great Walks season. You can choose to book transport to and from entry/exit points for the track - the walk is one-way with the track ends approximately 350 km apart. See Getting there - Routeburn Track. Decide what direction you want to walk the track in - from Routeburn Shelter near Queenstown or the Divide Shelter near Te Anau. Note, shuttles and vehicle relocations are available between both ends. Drop off and pick up times of transport operators. Find transport operators on the Destination Fiordland or Destination Queenstown websites. Decide the date you want to stay at each hut/campsite. Starting your walk on a different date. Rearranging your walk to use a different combination of huts/campsites. Find transport operators on the Destination Fiordland or Destination Queenstown websites. Check the availability of transport services on your desired date. Book huts/campsites. If you're booking campsites you'll need to know the number of people in your group as well as the number of tent sites required.Booking is required in the summer season for all ages. Optional: Book transport to/from the start/end of the track with a transport operator. One track end is at the Routeburn Shelter (near Glenorchy and 68 km from Queenstown). The other is at The Divide Shelter (on the Milford Road, 85 km from Te Anau). Destination Fiordland and Destination Queenstown also have information about service providers. It's also possible to make a circuit by combining the Routeburn Track with either the Greenstone and Caples tracks. As with any outdoor experience, the decisions you make and your safety are your responsibility. Check conditions – check with the DOC Visitor Centre for track conditions and weather before your trip. Take the right gear for all conditions and enough food. All walkers should take a first aid kit. Get a list of what to take. 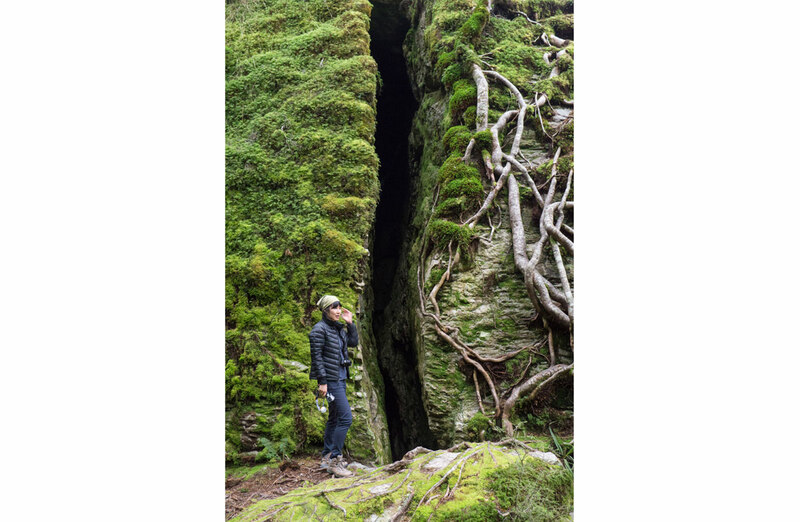 If walking outside the Great Walks season we recommend you also take a mountain radio and/or personal locator beacon. 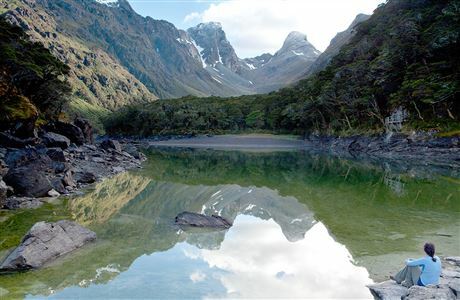 Also see Walking the Routeburn Track outside the Great Walks season. Your mobile is not useful as there is no coverage for the Milford and Routeburn Tracks and very little on the Kepler Track (limited to high areas). We recommend you tell someone your plans and leave a date to raise the alarm if you haven't returned. For how to do this, see the Outdoors Intentions process – AdventureSmart website. Sometimes the Great Walk tracks need to be closed for safety reasons (eg avalanche danger, flooding or high winds). If walkers are not able to proceed, options are available. These may include a refund (if walk not started yet), changing direction on the track or transfer across hazard areas. DOC staff will keep you informed of all issues and options. The tracks are very well marked but if you become lost you should stop, find shelter and stay calm. Put on extra clothing and assist rescuers should you hear them searching for you. If you are injured or become ill, use your first aid kit immediately and contact DOC staff if needed. In case of emergency an evacuation may be possible. During cold, wet and windy conditions, hypothermia (drop in core body temperature) can become a serious problem. From initial stages to unconsciousness can take as little as 30 minutes. Wear warm and weatherproof gear and eat regularly during your walk. These symptoms may indicate initial stages of hypothermia: shivering, clumsy, confused, have slurred speech, may deny they have a problem. To treat: immediately make or find shelter, get the person into dry, warm clothing, put into sleeping bag, give warm, sweet drinks, monitor and seek immediate medical help. Heat exhaustion is usually caused by warm temperatures and not drinking enough water. Carry and drink water regularly throughout your walk. A person in the early stages of heat exhaustion may show weakness, dizziness, nausea or vomiting, loss of appetite and sweating. To help, give them water and find a cool place to rest. Take care to put ashes from hut fire places in the metal drums to avoid huts burning down. At campsites only use the designated areas. No open fires are permitted in Fiordland National Park. During and after heavy rain, flooding of tracks is common on all Great Walks. Stream and river levels will drop rapidly once rain stops. If you are caught between flooded streams seek higher ground and wait for water levels to drop. Kepler Track – Iris Burn Valley. Milford Track – between Hirere and Bus Stop in the Clinton Valley; and between Boat Shed and Poseidon Creek in the Arthur Valley. Routeburn Track – Routeburn Valley. Whenever you are walking in alpine areas or exposed areas on any of the tracks, such as over passes, saddles and along mountain ridges, you could be caught in strong and/or gusty winds (eg over 80km/hour winds). Take care to dress warmly as wind-chill danger is worse at these times. Snow avalanches are common on all tracks, especially between late August and early November. Danger is higher during or directly after snow and rain. Avalanche and snow hazard can change rapidly from low to high within a 24 hour period. Follow all advice given by staff. Start zones of avalanche paths often cannot be seen from the track. In danger areas, do not walk below other walkers. Kepler Track – 9 avalanche paths cross the track between Luxmore Hut and Hanging Valley shelter. Milford Track – over 57 avalanche paths cross the track between 6 Mile in the Clinton Valley and Quintin Hut in the Arthur Valley. Routeburn Track – over 32 avalanche paths cross the track between Routeburn Falls hut and the Earland Falls. Routeburn Track – the area halfway between Routeburn Flats and Routeburn Falls Huts is prone to slips after heavy rain. Care is required when traversing this area. If in doubt, do not proceed. There are steep drop-offs along sections of the whole Routeburn Track. Mind your step and supervise children. The winter environment in Fiordland is very cold and wet, with ice, snow and short daylight hours. Avalanche-prone bridges across some major watercourses are removed. DOC does not manage hazards such as flooding or avalanche. Walking the track at this time should only be attempted by fit, experienced and well-equipped people. 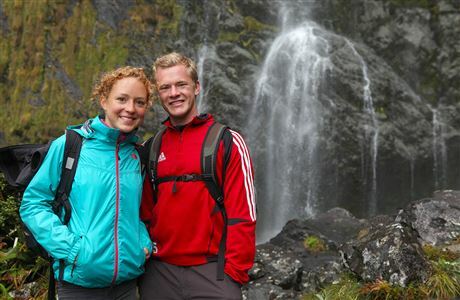 For more information see Walking the Routeburn Track outside the Great Walks season. For safety reasons the Routeburn Track doesn't operate as a Great Walk/Easier tramping track during May to October. If attempting the RouteburnTrack at that time, you'll need additional equipment. 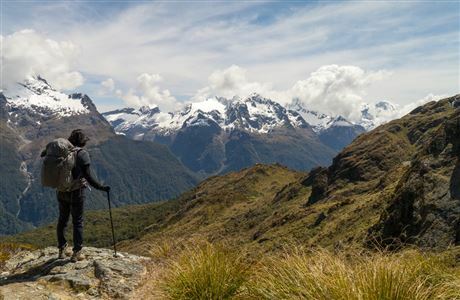 See Walking the Routeburn Track outside the Great Walks season. Our partners at Air New Zealand have helped to reintroduce three healthy whio/blue ducks back to the Routeburn.